Spring break wouldn’t be spring break without a road trip. My husband, son, and I made the trek to visit all of the grandparents for this past Easter weekend. My road trips have changed since having my son, in some ways they are wilder and crazier – much more screaming, singing, eating, and throwing food! When I go on a road trip I always try to wear comfortable clothes that won’t wrinkle. I hate showing up somewhere with wrinkled clothes! Striped open knit sweater by 525 America $14.99 at Costco. 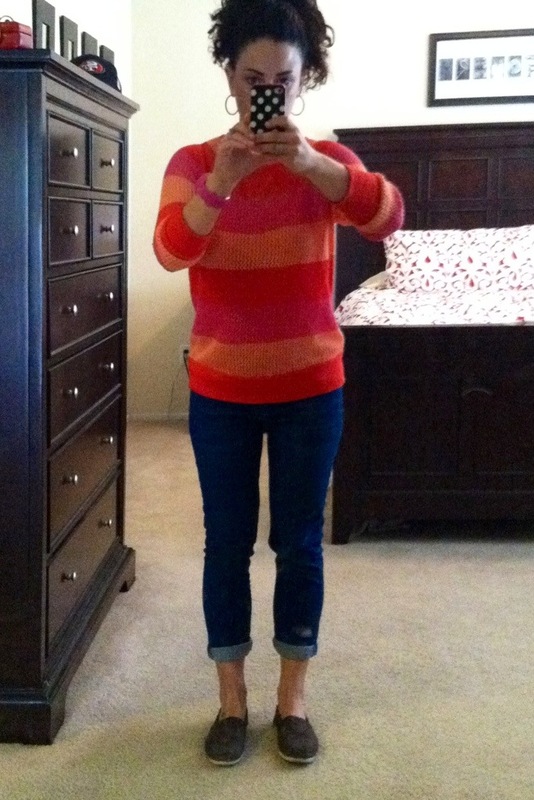 I love the sorbet colors of this sweater. 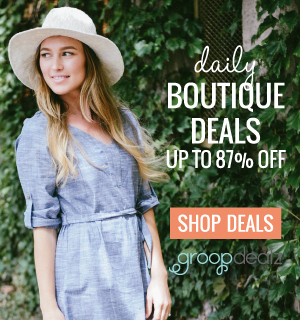 It is perfect for a road trip because it is light and comfortable and doesn’t wrinkle! 7 For All Mankind Skinny Crop & Roll Jeans $69 Nordstrom Rack, bought last spring. These are the most comfortable jeans, they have a little stretch so they keep their shape and stay fitted. I love the color, it is a bright blue denim, perfect for spring. Brown chocolate Toms $34.99 Nordstrom Rack, bought last spring. Fuchsia plastic watch $6 Target. 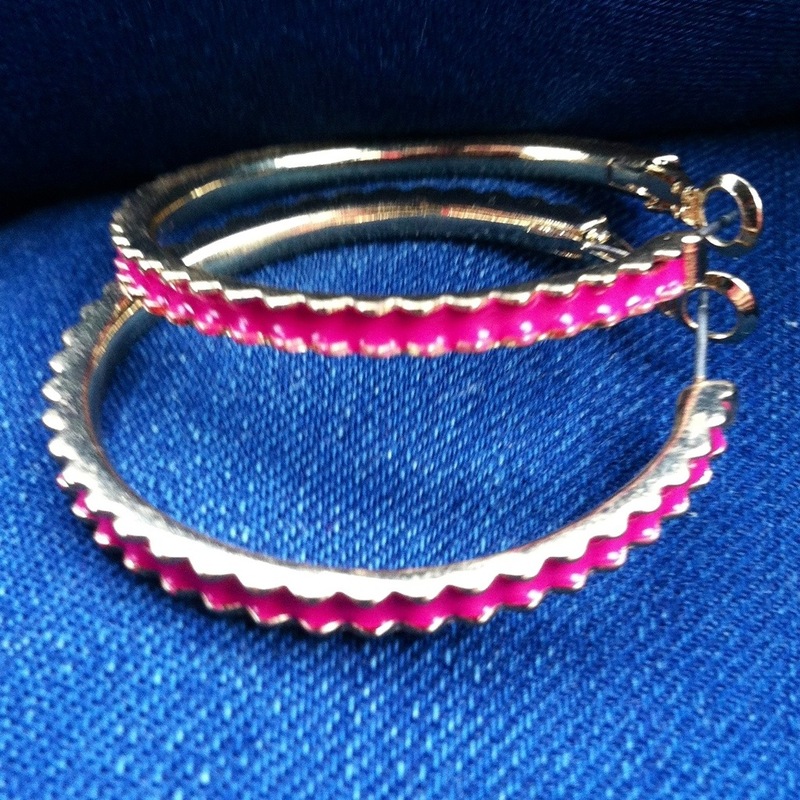 Gold and pink enamel hoop earrings $4.48 Target. White mod sunglasses $3 Target, bought last week. Always wear sunglasses in the car! Even when it is overcast, the UV rays penetrate through your windshield and are extremely damaging! Also, always wear sunscreen when going on road trips. I have learned the hard way by getting burns and pigment damage from overexposure to the sun from driving. 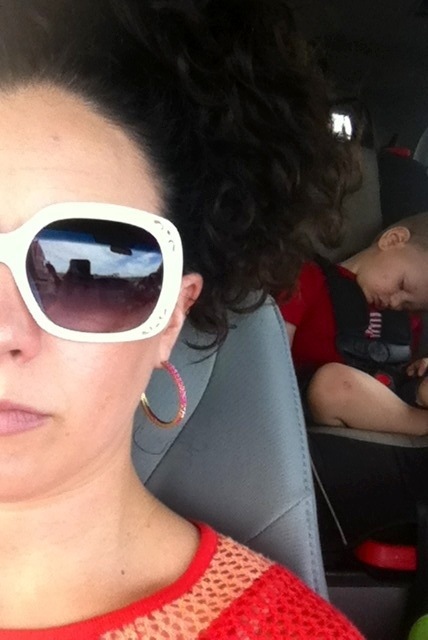 My son passed out on our trip, I think he couldn’t take my husband and me singing any longer! 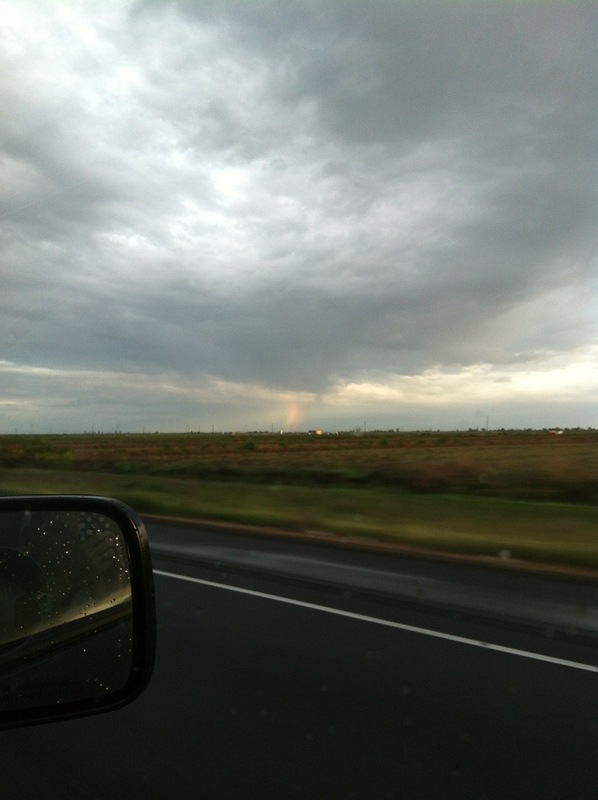 Saw this cool rainbow on our way home. I love how the clouds looked and how the rainbow appeared to be coming down from the clouds. When you go on your next road trip remember to dress in comfortable, wrinkle resistant clothes. Thanks! You just summed up my style 😉 simple and cute!